(CBS News) The Internet is getting a hall of fame with inaugural inductees that include the fathers of the Internet and one U.S. Vice President. Three award categories were created for the Internet Society's Hall of Fame: Pioneers Circle, Innovators and Global Connectors. Pioneers include "individuals who were instrumental in the early design and development of the Internet." The Innovators category honors "individuals who made outstanding technological, commercial, or policy advances and helped to expand the Internet's reach." Global Connectors are "individuals from around the world who have made significant contributions to the global growth and use of the Internet." The Internet Society's Hall of Fame announced its first round of inductees Monday at the Internet Society's Global INET conference in Geneva, Switzerland. Along with innovators Vint Cerf and Robert Kahn, who had vital roles in founding the Internet, Vice President Al Gore got a nod as a Global Connector. 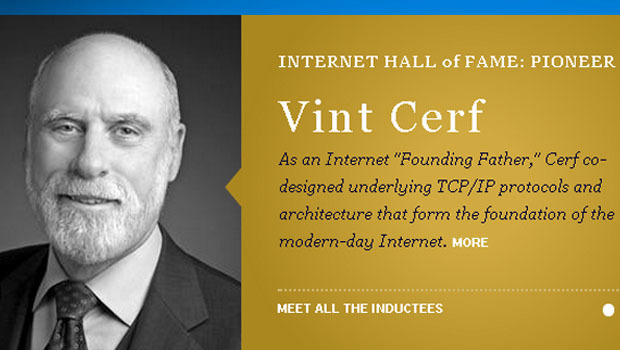 A full list of inductees is posted at the Internet Hall of Fame website. Recognizing individuals who made outstanding technological, commercial, or policy advances and helped to expand the Internet's reach: Mitchell Baker, Tim Berners-Lee, Robert Cailliau, Van Jacobson, Lawrence Landweber, Paul Mockapetris, Craig Newmark, Raymond Tomlinson, Linus Torvalds, and Philip Zimmermann.